Affordable, Flexible, Experienced http://www.wingstosoaronline.com by Emerson Sandow Learning challenges are no longer confined to a few students who suffer with dyslexia or ADHD. Now, the spectrum of difficulties include a wide variety of recognized learning disorders, including dyscalcula (math challenges), spelling, reading comprehension, writing difficulties and Autism to name a few. 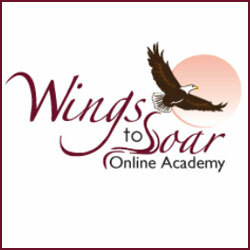 For parents and students who are faced with these stress-producing struggles, Wings To Soar Online Academy holds the key to learning success. First of course, is homeschooling. Many children facing learning challenges cannot obtain the needed instruction approach in institutional schools, so having the online, in-home academy is a must. Secondly, Wings To Soar is completely directed toward helping these homeschooled students to prosper and grow with a personalized curriculum that fits each child. Parents begin by completing the e-mail Just-Right Level™ Assessment questionnaire that allows the Wings To Soar Intervention Specialist to compose a series of customized assessments to find out exactly what the child’s learning environment is. The topics addressed are: Reading, Spelling, Vocabulary, Writing, Language and Math. This ultimately produces the specific curriculum that the academy e-mails to the parents to aid them in moving forward with their child’s education and learning success at Wings To Soar. Another positive point in the Wings To Soar approach is that if you are using a curriculum you like, except for one area of study, for instance, Wings To Soar will offer you supplementation in that one area. The Academy’s interest is in your child’s success and your piece of mind. Founder, Beth Ellen Nash, has over 19 successful years’ experience working with children who possess learning challenges. It is fairly common knowledge that many of the great inventors, thinkers and achievers of our world, had the learning challenges Wings To Soar addresses and with a positive attitude and the necessary teaching approach, these perceived “weaknesses” can become strengths. Wings To Soar recognizes that no child needs to achieve less just because of a learning challenge. If you think your child may possess a learning challenge – or you already know it to be so – visit the Wings To Soar Academy’s website and begin the path to academic success right away! E.S.